We’re delighted to announce that as of today Swrve is supporting “OTT” apps within digital media streaming environments such as AppleTV, Roku, Android TV, and Amazon Fire TV. 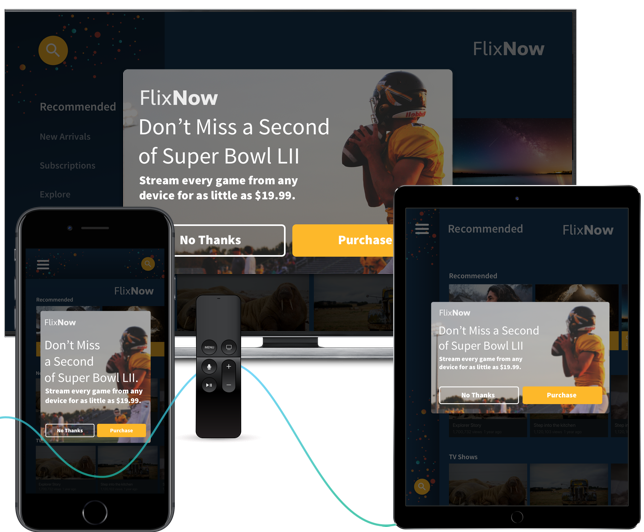 Simply put, that means Swrve can be used to design, deliver and target messages delivered to consumers within TV apps - and thus offers multi-channel insight and campaigns to media and entertainment organizations looking to drive engagement and revenue. So why have we added this capability? Well, some of our customers have asked for it. But more importantly the rise of OTT is effectively impossible to ignore for any organization serious about supporting communication with the consumer in every available channel. Pay TV is in decline. Every quarter, 1.5 million US consumers abandon traditional paid TV bundles in favor of streaming media direct from content providers via apps accessed on a media streaming service, and over the home network (hence Over The Top). Fifty-four percent of US households use OTT platforms today, and that number continues to rise as choice and quality continue to improve. On average, consumers spend an astonishing 2 hours a day consuming digital media. And all these numbers add up to one thing: if you want to talk to the consumer, this is a place you need to be. Perhaps even more significantly, as noted above this represents a unique opportunity for content providers to cut out the middleman and build a direct, profitable and enduring relationship with consumers - across all the channels they use. We like to think we know something about that process, and we certainly know something about the app ecosystem, whether phone or TV. So we’re bringing that knowledge and experience to OTT and allowing our customers to send ‘perfect message, perfect time’ campaigns across OTT networks based on real-time customer intelligence. For media companies in particular that makes for a simple proposition. Their customers interact with them in multiple channels, for example by watching one episode of a show on mobile, and others via OTT networks. That means a requirement to track customer behavior consistently across all those channels, and then interact to boost engagement, retention and revenue. - We provide insight. Every fragment of customer behaviour - from first interaction years ago to latest interaction seconds ago - is structured, available and actionable. - We provide an interaction engine, supporting communication across all platforms and channels individually with customers. If you’d like to learn more about our OTT offering, please drop us a line, or read more here. We look forward to hearing from you!